This map depicts Europe when the ice sheets were not at their fullest extent, but when conditions were colder than those of the present day. Features to be noted are the extension of the coastal plains as a result of the lowered sea level - the British Isles, for instance, are joined to the Continent. 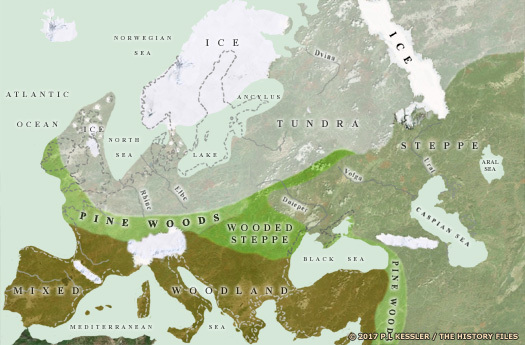 Equally, woodland is absent from Northern Europe, which would have been covered by tundra and, in more sheltered parts, pine woods. Deciduous trees would have been restricted to the south of Europe, although dwarf varieties may have survived in some northern areas. As conditions improved, the vegetation zones would move north. The Baltic Sea was cut off from the North Sea and formed a deep, brackish lake. The warm waters of the Gulf Stream would have been diverted southwards during colder times, enhancing the cooling of the land in north-western Europe. Just as the vegetation zones changed to reflect the variations of climate so too did animal distribution. Present-day patterns became established only 10,000 years ago. Image © P L Kessler and the History Files. Text drawn from the Times Atlas of Archaeology (1989). An original feature for the History Files. Go back or return home.